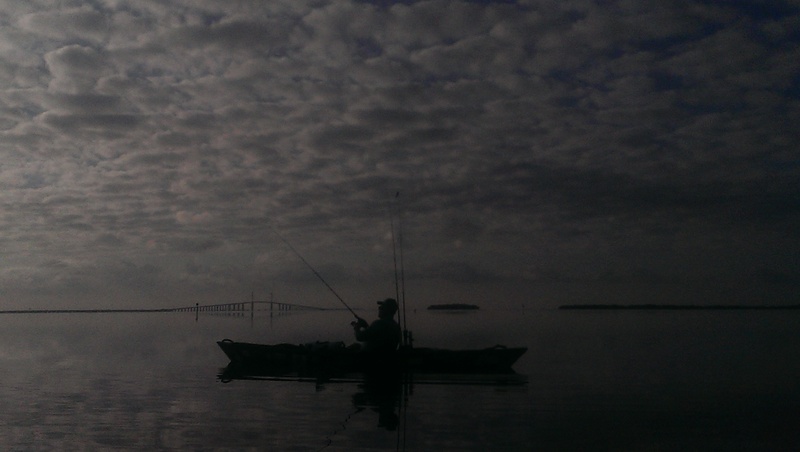 We live in just about the best place to be to start out a new year, weather-wise and also for stellar fishing action. The long hot summers can be oppressive for daytime anglers. 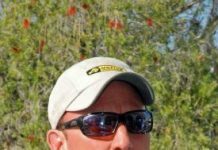 What about January and February for fishing in the Tampa Bay area of Florida? Potentially the coolest months of the calendar year, the fish are there and they have to eat to survive. It is a time of opportunity but with the potential of colder weather, some things can make the experience much more enjoyable and successful for anyone who doesn’t want to “sit it out” waiting for Spring. Perspective: We do not have to drill holes in ice to go fishing! Simplicity in the name of the game: Dress for it and you can enjoy all the opportunities that wintertime fishing has to offer. “Gear up” with waterproof jacket and pants; wear extra layers underneath as necessary. For anglers who may want to get out and wade, breathable waders are a great choice. In the water, it keeps you from getting wet and chilled. Out of the water, you won’t get overheated if things do warm up during the day. Safety is always first, and there are perils to the wintertime scene. Of course, no one wants to fall in the water but…. Wear your personal flotation device! Those clothing “layers” will make you sink like a rock if you end up in the water but the vest will keep you afloat. If you are using the breathable waders, a wade-belt helps to seal the top of the waders preventing water from going in, but it will also push your upper torso into the water unless you are wearing the life vest. Oversize dry bags with towels and a set of spare clothes is a great way to prevent hypothermia should you take an unscheduled Polar Bear swim. Get out of the wet clothes and change into dry, warm replacements that were “on the ready” and you have no idea how happy you will be you had it there. Other items to consider to have ready are gloves, a stocking cap and hand-warmers to get you through the toughest of conditions. Again: Stored in dry bags, perhaps not utilized, they are treasured on the days they are used. Getting back to the right game plan for success: Study the winds and weather. Go to protected areas that are shielded when the weather is tough and enjoy the fact that the fish often retreat to those same areas. Inshore areas like creeks, rivers or the lee side of shorelines and islands provide a substantial wind “break”. Life is short. So, the weather’s not exactly ideal: Go fishing! But do it smart and stay dry, stay warm, stay safe and catch some fish! Middle of winter fishing in the Tampa Bay inshore waters can be very good but it is much different than the other ten months of the year. The weather dictates where your best fishing will be this time of year. The optimum success comes to those who pay attention to “what the weather will be” as well as “what the weather was.” If the weather conditions are mild and consistent for a few days straight, the fish may be roaming their normal locations. When bitter air plunges over the area, and water temperature plummets, the savvy anglers make the right adjustments to these changing conditions. The critical adjustment is selection of your fishing locations. The water on the open flats can get very cold in these situations so the canals, rivers, creeks or the outflows of local power plants become the locations to target in this situation. The rule of thumb: Find areas that have water that is warmer and you will find the gamefish. 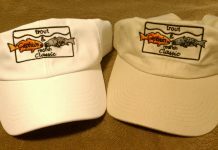 Another item that is pertinent is “when” to make your fishing trip. Most of the year, just after sunrise or just before sunset are ideal times to make your fishing trips. In contrast, the middle of winter, particularly after nights with very low temperatures, fishing later in the day is much more productive. The sun will heat up the water a few degrees by mid-morning and the fish will become more active. Overall, the tides are much more important than the position of the sun. Moving water will usually translate to excellent feeding activity. Getting to the right locations is the first part of the equation, the next is: How to get fish to eat. 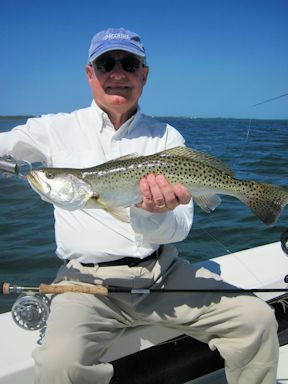 Trout, snook and redfish will all eat a lure but when the water temperatures drop, they often won’t “chase it down” if you are moving it at a steady to fast speed. Slowing your lure retrieve way down is critical. Another solution is to “go natural.” The shrimp is the all-around most versatile “backup” bait of choice. A lot of the inshore species feed on crabs and shrimp this time of year. Shrimp will also give you the option of catching a sheepshead or a black drum if the opportunity presents itself. A medium to large live shrimp with the fan of the tail pinched off works extremely well, but fresh dead shrimp kept iced down will also get readily devoured. Use a size 1/0 hook and a single split shot. 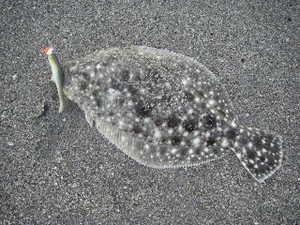 It becomes a simple matter of putting the bait where the fish are and patiently waiting for the offering to be eaten. Knowledge of the varying species wintertime habits and tendencies makes a big difference. 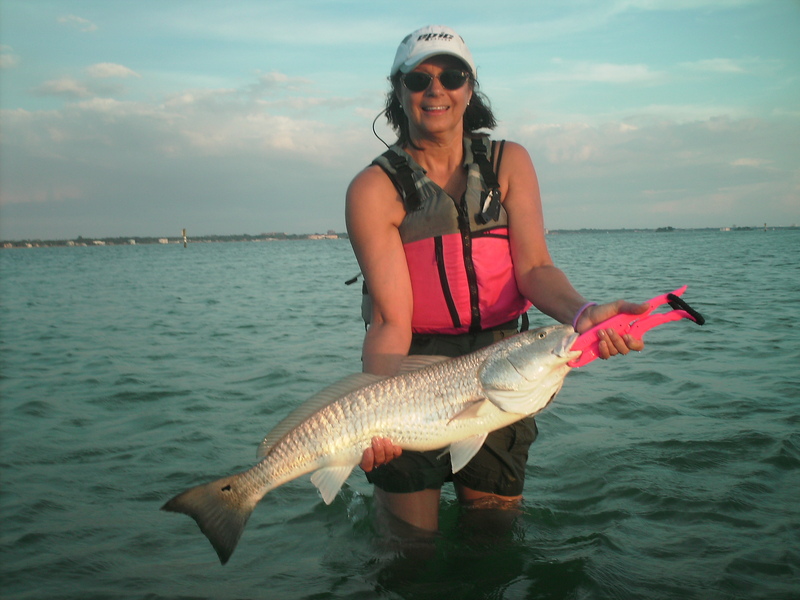 Redfish are not as cold sensitive as most people think. 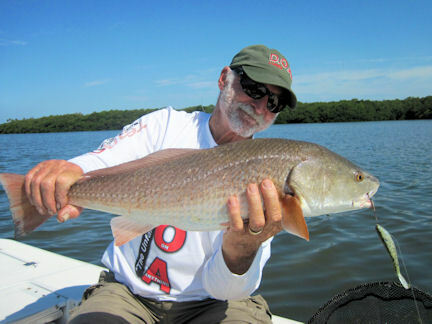 There are plenty of redfish in their normal warm weather locales. Choose a low tide and the rising tide that follows. A kayak is ideal for accessing these very shallow water areas. Redfish will collect on the pockets on the outside of the flats and move up the flat with rising water. The same pockets of deeper water that hold redfish on the lowest tides will hold large trout when the water reaches the middle part of the rising tide. Snook also feed aggressively on these rising tides. To locate snook, search the areas that are away from the open waters such as the aforementioned creeks, rivers, and canals. “Bottleneck” areas, narrower than the surrounding areas of water, with good current flow are feed stations for snook. Like any other month of the year, great fishing trips start with the right “plan.” In the dead of winter, plan on making the little adjustments to enhance your success on the water! In winter things do change but it is very weather dependent and temperature dependent, fish will move around quite a lot, if there is a long cold snap they will be in deeper, more protected areas, areas with mud or silt bottom which hold in heat better than sandy bottom. A warming trend and they will venture out onto the flats and mouths of rivers and creeks and even on the coldest days there will be fish on the flats. Wintertime takes a lot more looking and searching and working out. Keep a journal fish one location and fish it often, try to pick a location with some or all of the following types of habitat. Deep water cuts, Freshwater spring fed creeks or rivers, dark soft mud bottom, sheltered shoreline especially sheltered from the colder North and Easterly winds, Seawall or rip rap shoreline Seawalls are like heat sinks, they warm up in the sun and hold in the heat so will warm the water around them, Oyster bars when exposed to the sun also heat up like seawall. Sawgrass shoreline, this is great habitat, crabs etc live in and around this grass and fish will get up in it on high tides to forage. Current, moving water brings food, so predators can wait for their prey instead of searching for it. All of these are areas to look for predators when conditions are right. Tides are important in winter, moving water means increased activity, when predators expend energy they must eat to replace it. Sunshine is a huge factor in wintertime fishing, flats that exposed on low tides will warm up in sun, as the tide comes in the water will flood and be warmed. To answer your questions, Backcountry means many things but your assumptions are right, inside of Cockroach Bay would be backcountry. 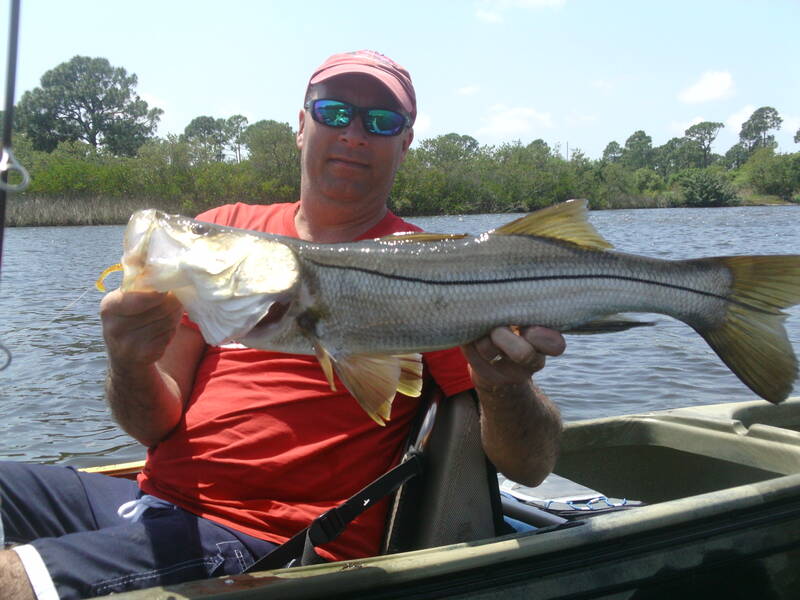 Water temps below 55 means trouble for Snook, but Red and Trout will still feed if they have too. Of course if the water temps cool, their organs cool, their metabolism cools, so they use less of their stored energy meaning they need to eat less. However as in all cases there are always exceptions, when a big easy meal is in front of them they will likely make the most of the opportunity. Time of day, I still like the first light bite, its just how I am, but if the night has been cold and the day will be warm, then later in the day will be more likely to be productive, I always keep an eye on out for the major solunar in winter, that occur around 2-4pm as this is typically the warmest part of the day, and if there has been an extreme low tide, meaning lots of bottom has been exposed to the sun and the max peak is around the same time, its a good chance this will be the best time to fish, but not always, as unfortunately the fish don’t always pay as much attention to the charts as I do. Baits, slow moving baits are certainly a better choice in winter time, I only fish with artificials so will not advise you on live bait, however a shrimp crept along the bottom should be the ticket. Big Trout move in around this time of year too and I much prefer a large top water when fishing for them, as they like a big bait. And although baitfish are more scarce they are still around and off much more return to the predator than crustaceans, meaning a 6″ finger mullet will give them much more fuel than a 3″ shrimp. Darker lures are a better choice if you are fishing areas with darker bottom, if you are out on the flats and water is crystal clear then a silver or gold color would be my first choice. My best tip to you though is to pick one area, that has flats, and a river or creek mouth near by, and fish it often, explore and keep notes, search out deep holes, dark bottom and sheltered shorelines, and you should start finding the hiding places of the fish you’re after. He also said, “The flats still produce just not always as well as they do other times of year. It becomes a competition for food game which is a reason I think the fish spread out to different areas once the water cools. You have to love this time of year for sight fishing. Even when it’s windy the water’s still very clear. There were redfish sight casted and caught 15 feet in front of the kayaks this week. There were also some huge trout hanging in sand patches in a foot of water. If snook’s your game, I’d say you might want to get off the flats and look somewhere else. The dark colors tip is a big one. They might eat some of the golds and lighter colors but if you aren’t carrying rootbeer colors, you may not get the attention of the ones that are concentrating on finding crabs to eat. Speed is another element. Going more slowly in the very hottest months or the very coldest months will also get strikes that you won’t get if you’re swimming lures faster. Lighter jigheads (and always have weedless ones available for the turtle grass areas) can allow you to move lures more slowly without hanging up or picking up debris. Location is a variable. Is it a mild winter? Has it been harsh like the last three? Winters where it stays mild the entire stretch of the short sunlight days, the fish may not evacuate the areas that are behind the barrier islands. With very cold conditions those areas become ghost towns. They move. Where do they go? The backcountry, the canals, creeks and rivers. Bridges, docks, pilings, seawalls and oysters provide potentially warmth but more importantly: Food. There’s enough to eat in these remote areas for them to be there. The best skills in clear water? Using the right outfit that has maximum casting distance is an advantage in the dead of winter. The choices are also different. 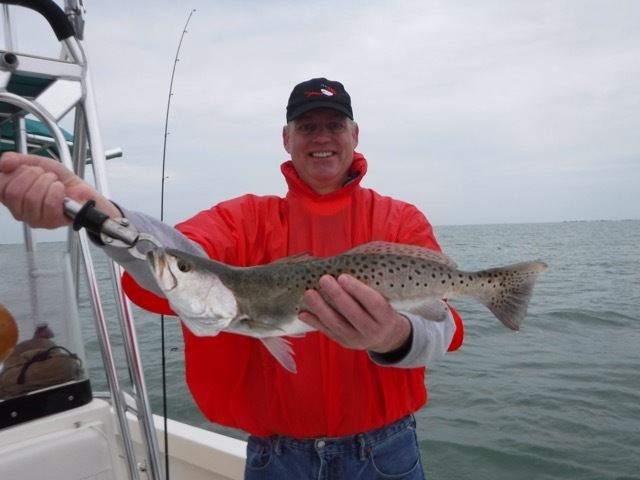 Even though we have access to our regular species in the wintertime months, you can also have fun with species like sheepshead, silver trout and whiting all with better availability in our coldest months. Wintertime and early spring bring a great respite from the long hot summers we have. Use caution, the water can be cruel. Dress appropriately and be ready for a worst case scenario. Hypothermia is a real threat here. There are great days of fishing to be had but are you going to make the right choices to help make it happen?